For the past two years Joyce Cranz has been worrying about the water in Leslie. The city has water problems of its own but not lead related. "I don't know if its iron plant that is bad or what it is. I really don't know but there's something wrong with this water and it's not just here in Leslie or in Flint" Cranz said. "It's all over the state. This water is not pure." Even with two filters in her basement pipes and kitchen, Cranz still doesn't drink the water because it is high in iron and has a bad smell. "You can go through sprees where it is half way decent and then the next thing you know it's back slimy again" Cranz said. The city has been trying for years to fix the high levels of iron. In 2013, it switched to a new distribution system that has supposed to fix the problem but instead caused more headaches. "The new water chemistry, the water wants to pick up that iron sediments so it picks it up and sometimes unfortunately what you'll have is it will pick up a lot of that iron sediment and it will distribute it to people's homes and businesses" said City Manager Aaron Desentz. Out of the 700 service connections about 20 to 30 connections have to deal with high levels of iron. The issue for a few homeowners in Leslie is that they live in much older homes so their pipes are smaller. When clean water is filter through the pipes it gets the iron from the rusted pipes. 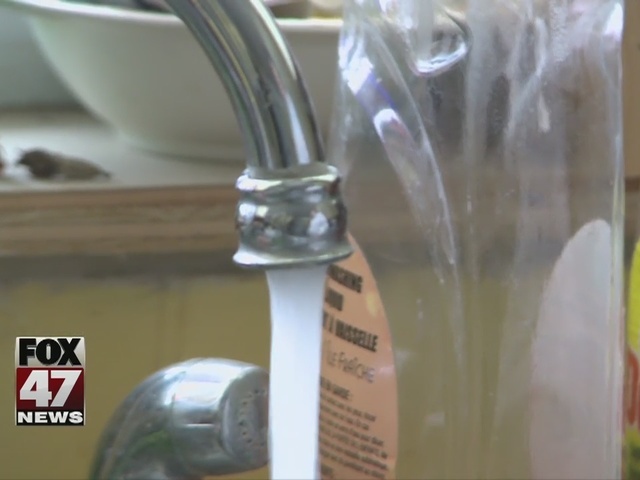 Desentz met with the Department of Environmental Quality Thursday morning and they have found that the city does not have high levels of lead but is high in iron. The city will continue to provide bottled water and cleaners to residents that need them, said Desentz.